Over the past few months, countries have made individual pledges on what actions they intend to take, called Intended Nationally Determined Contributions, or INDCs. As it stands right now, the pledges countries are bringing to Paris will put the world on track for between 2.7 and 3.5 C of warming above pre-industrial levels. (The gap there has to do with what you assume countries would do after 2030, when the pledges run out.) The Intergovernmental Panel on Climate Change warns that at around 2 C we’ll begin a cascade of devastating effects. It’s not realistic to think that countries will substantially increase their current pledges, so the Paris agreement itself won’t forestall dangerous levels of warming; it’s only a first step on the road. 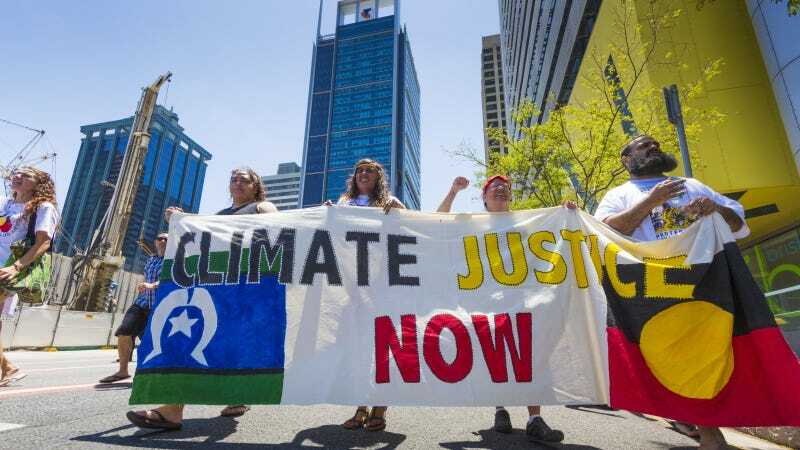 But getting countries to universally embrace the goals of keeping warming below 2 C and shifting to 100 percent renewable energy by 2050 is still important to activists because of the effect it may have on the media narrative and the business and political communities. 2. A “ratchet” mechanism for strengthening the targets. If you get countries to say they want only 2 C of warning but they’re agreeing to a path to 2.7 C or more, then the next obvious question becomes, how do you close that gap? The answer is through future agreements where everyone commits to stronger emission-reduction targets. Activists want the Paris agreement to include a regular schedule for revisiting pledges and targets, referred to as a “ratchet” mechanism, because it would ratchet down the emissions targets over time. Most countries’ INDCs cover their actions through 2030, but climate hawks want to see them come back to the table much sooner than that, starting at around five years from now. If countries don’t step up and do more before 2030, staying below 2 C will be nearly impossible. After several years of everyone showing that they are working in good faith to achieve their targets, and watching renewable energy prices keep dropping, countries may be more willing to make bigger commitments. 3. Funding to help poorer countries. It’s one thing for rich, developed countries to say they’ll cut their emissions, especially because it doesn’t have to hurt their economies. But it’s much more challenging for poor countries to build a clean energy system while lifting their people out of poverty and bringing reliable electricity to the many who don’t have it. If poorer nations are to ramp up their their renewable energy capacity and develop in a green way while trying to adapt to the climate changes that are already happening, they’re going to need a lot of financial assistance to do so. Since the Copenhagen climate talks of 2009, the international community has been talking about raising $100 billion a year by 2020 to help developing countries cope with climate change, but few individual rich nations have ponied up much so far or pledged specific amounts that would add up to that. Activists will be pressing them to do so in Paris. There are also grassroots efforts to apply pressure. Although rallies in Paris itself have now been forbidden in the wake of the terrorist attacks, green groups are circulating petitions calling for a strong agreement. They will also be holding rallies in capitals around the world on Nov. 29 and advertising in the media in those markets. Other events in Paris, like the “Village of Alternatives” that will showcase sustainable, people-powered solutions to energy challenges, will go on as planned. Those acting as lobbyists at COP can also play a middleman role. While negotiators are stuck in rooms with their colleagues, lobbyists roam the hallways and are often actually better informed as to rival camps’ negotiating positions. “Negotiators don’t always talk to everyone, don’t always know what everyone’s thinking,” notes Schmidt. “So part of it is to say, ‘So-and-so is considering this as a middle ground, how’s that?’” Schmidt emphasizes that they aren’t in the business of helping to hammer out a deal for its own sake: they have a viewpoint and they aren’t going to offer up compromises that they don’t support. But they’re especially well-positioned to serve as facilitators because in some progressive developed countries NGO staffers are actually part of the national negotiating teams, and in many developing nations they are relied upon for their expertise. So American climate activists will come to Paris with strong relationships with colleagues that can help them bring mutually suspicious governments together. And those governments are going to need all the help they can get.